The All Saints Metallic Bay Shopper is metallic shopper version of the popular Bay bag, which is new for the AW 2011 season. 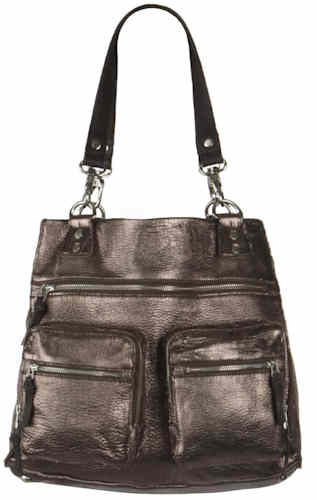 The bag is casual and slouchy, and has been constructed from garment washed leather with a metallic finish. It has two detachable brown leather shoulder straps, together with lots of external pockets – there are two zip fastening smaller stand out pockets on the front, together with a further, wider zip pocket, and there is a further similar pocket on the reverse of the bag. Inside, the bag is lined in cotton and there are further zip pockets. This bag is delivered with a dust bag for storage. Measurements: 31cm / 12.2″ (height) x 37cm / 14.6″ (width) x 16cm / 6.3″; strap length 51.5cm / 20.2″ (all measurements are approximate). Style note: Add a touch of sparkle to your accessories wardrobe with this gunmetal shoulder bag from AllSaints. The bag is slouchy with lots of pockets and features nice designer touches such as the studs on the base to prevent the bag being scratched, together with a dustbag for storage. Team it with your casual jeans outfits to smarten up the look.